The Indian government announced on Wednesday that they expect nuclear generating capacity to reach 10,080 megawatts of electricity in 2019. Currently, there are many projects that are either under construction in the country or are in the commissioning and planning process. The International Atomic Energy Agency's (IAEA) Power Reactor Information System reports that six reactor units are under construction and that there are a total of 21 operating units in the country. In 2014 Indian nuclear reactors generated approximately 33,231.9 gigawatt hours, which is approximately 3.53 percent of the total amount of electricity generated in the country. 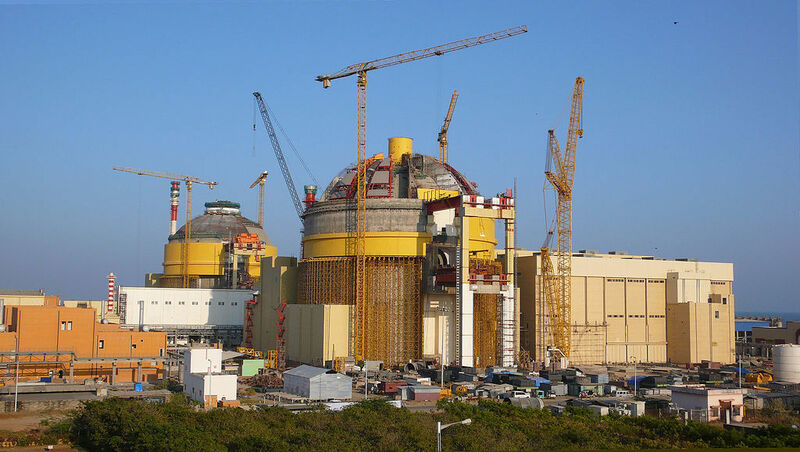 Two units are in the planning stages to go under construction at the Gorakhpur Haryana Anu Vidyut Pariyojana (GHAVP) plant, and two are under construction at the Kudankulam Nuclear Power Plant. The GHAVP units are rated at 7000 megawatt capacities, and the Kudankulam units will have a 1,000 megawatt capacity. In 2014, the government reported that it would take on an expansion project that would triple the nuclear energy generation capacity of national power plants — at the time the capacity was listed at 4,780 megawatts — within a 10-year time frame. They also report that the first unit at the Kudankulam plant entered commercial operation in December, which added 1,000 megawatts of electrical capacity.